Welcome to Morocco! Upon arrival, you will be met by your driver and drive to Casablanca, the commercial capital of Morocco. The group will visit this intriguing city, including a visit (if arrival times allows) to the Hassan II Mosque, the world’s 2nd largest mosque. Stay the night at one of Casablanca’s fine hotels. In the morning you will drive one hour north to Rabat, the capital city of Morocco and residence of the King. In the afternoon you will play the Dar Es Salaam Royal Golf Course which is ranked in Golf Magazine as one of the top 100 courses in the world. The Red Course will especially challenge and delight you. 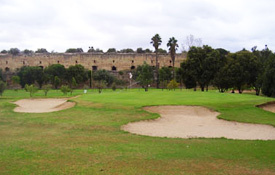 Grab your clubs as your next golf outing is at the Fes Royal Golf Course. Situated among countryside olive groves at the foot of the Middle Atlas Mountains, the course is characterized by undulating fairways and sloping greens. Play in the morning and then return for an afternoon tour of one of the oldest walled cities in the world. After breakfast at the hotel, take a quick stroll through the medina to shop among the hundreds of curiosity shops of the old city. You will then be shuttled to the Fes airport for departure.